Annette Bjorklund, 4-H Youth Development Educator with the University of Wisconsin Extension, Washburn County, trains volunteer leaders for eleven 4-H clubs in her county. Within each club, the members, ages 8 to 18, choose from a variety of projects in which to participate. 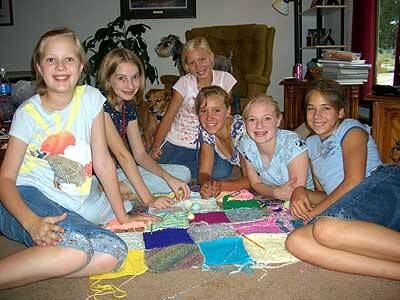 The knitting and crochet projects are just two of the dozens of options open to 4-Hers. 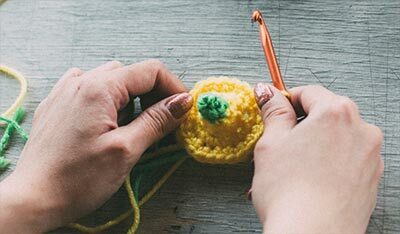 Annette shares her experiences with the knitting and crochet club she leads. SPECIAL NOTE: Members of the Washburn County 4-H, along with Annette Bjorklund, organized and supervised the Kids' Krafts booths at the 2008 Knit-Out & Crochet event at Mall of America. They taught dozens of other kids how to knit, crochet and have fun with yarn! 4-H is all about teaching life skills. 4-H is a non-formal, out-of-school educational program that kids choose to belong to. The 4-H year runs from October-September. Kids sign up in October. Each member is enrolled in a general 4-H club where they participate in education, recreation, and community service projects. 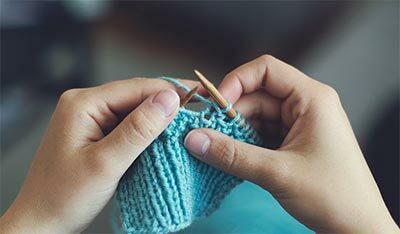 In addition to club participation, there are numerous projects to be involved in; knitting and crochet are two options. Within each project area, life skills, leadership and citizenship skills are taught. For instance, for knitting and crochet, members have to learn to work together, communicate with others, understand math, etc. Annette points out: "I may challenge the members to modify a pattern which will require that they use their math skills. Annette leads the knitting/crochet group because it's her personal passion. At the first meeting she asks what each student's skill level is and what he or she want to learn or make. They figure out a regular meeting schedule. 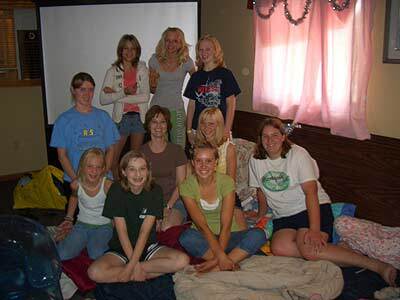 For her group, they have been meeting almost once a week for two-hours in an evening. The two-hour time frame and once a week schedule is just a perfect amount of time to get kids started, clarify problems and then have the kids go home and work on their projects until the next meeting. Annette starts the knitting and crochet class in January and continues through to August, depending on her and the members' schedules. There are approximately 12 members who attend all the meetings. Everyone is at a different level. Ages can range from 8 to 18. What is stressed is that there is no grade, no competition. It's all positive. Annette says: "I don't always have to be the teacher. Since 4-H promotes youth leadership, I will frequently ask one of the older members or more skilled members to help another with a skill or problem. The younger members look up to the older members. It promotes a healthy youth relationship. Group environment is also a positive one for dealing with the really challenging things of learning a skill. In knitting and crochet, for instance, it's ripping out. If you were on your own and had to make a mistake and rip out, you'd probably put aside your knitting and not pick it up for a while. In a group, kids are encouraged to work through the problem and keep going. There is wonderful camaraderie that develops in the group. In this relaxed setting they enjoy talking to one another. What do they want to make? Everything…scarves, hats, mittens, ponchos, sweaters, afghans. Unless they are beginners, they start in on any project. For beginners, Annette has them start on a swatch. They knit several rows, then purl, then alternate to create stockinette and then rib. Once they get through that exercise they are usually ready to start a project. Last year as their charity project, the students in Annette's group made an afghan for a homeless baby. Each made individual sections from different yarns and the finished afghan was presented to the auxiliary fire department liaison. This year, because of a book they received for volunteering at Knit-Out, the girls want to make toys and donate them. Kids have so many great ideas. All they need is an adult to say: "Great, let's do it!"